Knots by themselves are any accidental or intentional entanglement of cord, braid, ribbon, beading, fabric or other material that will create a new shape or structure by forming loops, intertwining, and weaving of the base fabric. The new structure may be used to enhance or accessorize many forms of dress. Simple knots and complex knots can be created using a few simple instructions from craft books. Using cords, beading, braiding, trims, ribbons, or other appropriate flexible material, the knowledgeable designer can enhance the appearance of any simple fabric by forming knots. 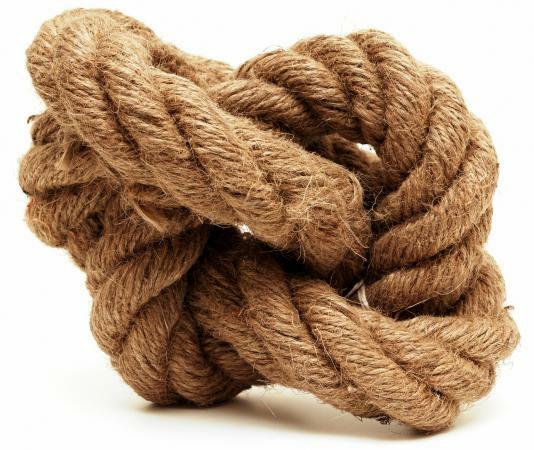 Knots are made by folding or twisting the cord over and under the standing part of the original cord. The end used to form the knot is termed the working end and the other part of the cord is the standing part. Cord may be formed into bights (a 180-degree turn with no crossing), loops (a more than 180-degree turn with crossing of the standing part), or combined into more complex shapes (a knot, bend, hitch, weave, braid, or multiple loops and bights) depending on the desired look. Fabrics may be twisted into a rope prior to knotting, whereas when ribbon is used, it is typically formed flat into bows, using bights pulled through the knot instead of pulling through the ends. Beading uses knots between the beads, to ensure that they do not all fall off if the support cord is broken. Knotting originated with prehistoric humans tying grasses and twigs, and later using sinews, into lashings used to hold together sticks and stones to make tools. Knotting also took on survival significance in the form of knotted garments and woven fencing and roofs to keep out the cold of the Ice Age. Knotting later took on religious and political significance and appeared throughout the world as carvings in stone and wood, in the shape of magical knots and heraldry symbols. 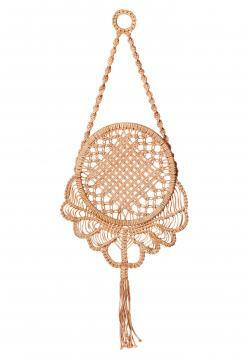 The most well-known form of knotting is macramé. Macramé (from miqramah in Arabic, which means "coverlet," or maqrama in Turkish, which means towel), originated in the thirteenth century in what was then known as Arabia with the tying together of the cords that formed the foundation of the carpets, for which the region was already famed. Macramé work spread from there to Southern France in the fourteenth century, then fell into disuse for several more centuries, until the early part of the nineteenth century. A slightly different form of macramé was also known by sailors in the seventeenth and eighteenth centuries as McNamara's Lace, a form of pulled-thread canvas work, in which silks and ribbon were fed through in place of the weft and in which the warp threads were knotted together to form patterns of knots, after the weft threads were removed. Warp threads are those that are parallel with the salvage, the vertical edges of a fabric; weft threads are those that cross the warp threads. Sailors would weave these pieces from scraps of twine, ribbon, silk, and rope that they carried in their ditty bags, which were often highly decorated canvas bags made of macramé and McNamara's Lace combined. Jewelry of woven gold and silver wire also produced rings, necklaces, anklets, and bracelets in adornment of simple medieval dress, while fancy knotted and braided leather belts were used to hold clothing in place, everywhere from Argentina to Canada and beyond. Knotting took on special significance in East Asian dress, where certain types of knots (usually rather elaborate ones) were considered charms capable of conferring health, wealth and well-being. Knots were used in Korea as adornments of wedding costume (maedup), and throughout the region as elements of Buddhist temple decorations and vestments. In Japan, special knots were used as ties to adorn gift-wrapping. Knotting took the form of free interpretive art with the resurgence of macramé in the 1960s and again more recently with the use of macramé pieces added to enhance the look of retro fashions. European and American dress has moved beyond the look of mesh, netting, and knotted articles to a more demure and international look in knotted shoulder straps, scarves, sarongs, pareos, and sandals, imitating Grecian and South Pacific styles. The elegance of lace and tatting also has not been lost to another age, but has seen recent moves to reintroduce these fine woven and knotted fabrics to enhance or highlight evening dress necklines and cuffs. Knots used in the early 2000s include the overhand knot, the Carrick bend, plaiting and braiding, the sheet bend, and the square knot. Knotting's simplicity and its intrigue add a touch of mystery and insouciance to a wide variety of forms of modern dress, and accessories. L'art des noeuds maedup: Tradition de la parure coréenne dans l'oeuvre de Mme. Kim Hee-Jin. Espace Pierre Cardin, Paris, 10-30 April 1986. Ashley, Clifford W. The Ashley Book of Knots. 1st ed. Garden City, N.Y.: Doubleday, 1944. Budworth, Geoffrey. The Ultimate Encyclopedia of Knots and Rope Work. 1st ed. London: Anness Publishing Limited, 1999. Graumont, Raoul, and John Hensel. Encyclopedia of Knots and Fancy Rope Work. 2nd ed. Centreville, Md. : Cornell Maritime Press, 1939. Lammer, Jutta. The Reinhold Book of Needlecraft. New York: Van Nostrand Reinhold, 1973. Rainey, Sarita R. Fiber Expressions. Worcester, Mass. : Davis Publications, 1979. Walkley, Victor. Celtic Daily Life. Rowayton, Conn.: Dovetail Books, 1997.